111c Bolt, 3/8'' 1926 - 12 12 24 N°00 Or perhaps 1924? 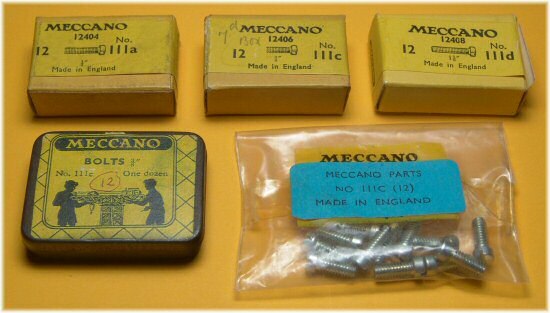 For the first eighteen years of Meccano parts, the only bolt was the standard part 37, at approximately 5/16'' it was not long enough to use as a complex pivot, but too long to fit neatly when bolting two or three parts together. It is a surprise that it lasted so long in that form. In 1922, a new bolt part number 111b was quietly introduced to the system. I can hardly find any reference to this part other than in the 1922 manual parts listing. It is for a new shorter 7/32'' bolt. One was included, only in the largest outfit 7, for a short period in the middle of 1924 and subsequently dropped. I have yet to find out why. Is this the rarest part ever? There is no announcement of part 111b in the MM. 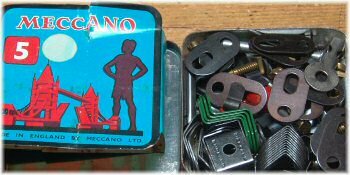 The "A Message From Meccano Town" catalogue (first advertised as available in the Sept/Oct 1921 MM) does not include it. In New Cavendish Volume 8, page 308, there is reproduced a price list dated March 1st 1922. This lists 111, 111a and 111b. The 1922 0 to 3 Manual (622/50) also lists 111, 111a and 111b. If these dates are reliable they place the introduction between Sep. '21 and Mar. '22. No, it's not rare at all. It's one of the most common, and replaced part 37 later in 1924. The standard bolt changed to 7/32'' (under the head) and part 111b was therefore obsolete. Although I should imagine that finding a dealer's spare parts tin of part 111b would be fairly unusual. 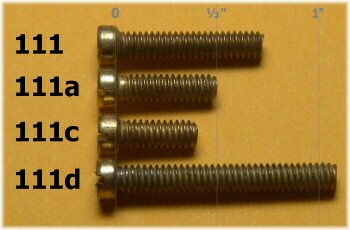 The photo to the left shows the three different lengths of bolt: on the left, the original 5/16'' bolt part 37, then in the middle the new shorter 7/32'' bolt part 111b (later renumbered to 37), and on the right the subsequently introduced shortest of the 'long' bolts part 111c, at 3/8''. DMS and EMP show part 111c, the 3/8'' bolt, as being introduced in 1926. The commonly available parts lists show it in 1926 but not in 1922. I would be very surprised if this were the case – the number of these much more common bolts in all outfits (even outfit 00) implies that it was immediately recognised that a few of the 'longer' bolts were required in all outfits, and that this part was introduced very soon after part 37 reduced to 7/32''. The six longer bolts (pretty much the same size as the old longer part 37) were needed in each outfit for lock-nutting and similar jobs. If one of the new short bolts were needed in outfit 7, it would only have been dropped if it had been superceded by the new shorter part 37, surely? We have to be terribly careful about dating, particularly from Meccano Magazines, as we have already seen the "announcements" can be well over 12 months late. The 1924 Magic Carpet catalogue (incorrectly described as a 1925 copy in Hornby Volume 8) shows part 111b, but the 1925 Magic Carpet catalogue (print date 1225/25) doesn't. The July 1925 manual 0 to 3 (725/100) doesn't have it either. Thus the deletion is between the printing of the 1924 Magic Carpet catalogue and July 1925. The July 1925 manual above doesn't show part 111c, but the 1926 "New Meccano" leaflet (926/35) does. The part is announced in the September 1926 MM. There is a model in April 1926 MM p.260 where the instructions still say that a 5/16" bolt should be used. If the 3/8" had already been introduced they would not do, they would say 3/8". I'm not quite as sure about the April 1926 date, since articles describing models in the Meccano Magazine could be very old indeed. The reference to a 5/16'' bolt does pretty much confirm that the 'standard' bolt was no longer 5/16'' by this date, but since we don't know when the article was written it could have been well before this date that the new 3/8'' bolts were being added to outfits. 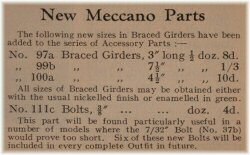 At a busy time for Meccano, the replacement of all bolts with shorter 7/32'' ones would surely have caused an uproar if there were no long bolts at all in the outfits. There may be another printing of these manuals, perhaps with the reference 539, 639, or 739. Do you have one of these? Does it show part 111d? The very long bolt, part 111d, is often considered a post-war part but was first seen in the Mechanised Army outfit of 1939 as part M111d. 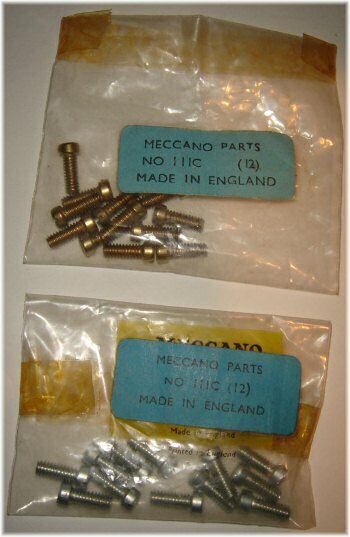 It shows up in parts listings as part 111d of standard Meccano just before the end of production in 1941, but didn't make it into the new outfit 10 until its reintroduction in 1950. The extract to the right, from the December 1939 Outfit 1 manual (reference 13/1239/65) shows the first known example of part 111d in the 'main' Meccano system. It doesn't exist in the December 1938 printing. The long bolts following the same sequence as the standard bolts, part 37. Starting with sharp-cornered cheesehead bolts, they change to domeheads in the late 20's, then back to cheeseheads. To make sure we all know what we're talking about, the photo to the right shows the three most common bolt head forms. On the left is the cheesehead (by far the most common), in the middle is the domehead (rarest, only for a short while in the late 20's), and to the right the roundhead (found in 1970s multikits and most outfits from 1978). Versions in black (for the Mechanised Army Outfit) exist for all but part 111a. The bolts then change to zinc cheeseheads in the 1960's. The 1970's Multikits see these bolts in matt brass and black finishes, then changed to round-head bolts in the same finishes, while the standard bolts are also found in an iridescent finish. In 1990 (or thereabouts), allen key heads appear, although very late outfits in the "Enthusiast" sets had zinc slotted roundheads right at the end of production. 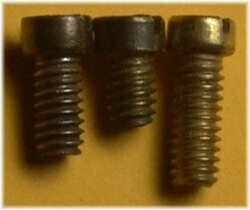 Now, it is often assumed that blackened long bolts appeared during the nickel and brass shortages of the Korean War (1951-52). However, the photo to the left shows an untouched (opened for the first time for this photograph!) small parts box from a late 1951 outfit 5. The pale blue round sticker on the box indicates the contents are blackened (as are the other parts in the outfit). But you can clearly see that the long bolts are still brass. Does anyone have any firm evidence that the long bolts ever went black during this period? Part 111c (the 3/8'' bolt) is also found nickel-plated domehead, as supplied in the Aeroplane Constructor outfits as part number P611c. The photo above shows a selection of long bolts in their dealer boxes. The yellow ones at the top are the normal small parts boxes from the 1950's and later (as the parts are not coloured, these could be early 60's too). The lighter yellow box top right is probably late in this period. On the bottom row are a small tin of part 111c, almost certainly 1930s (from the cross-hatching on the label), and bottom right a pack from the late 60's or early 70's. This plastic bag of part 111c is in fact in a pre-printed bag for part 111a (you can see the yellow label behind the blue one) – they must have run out of the right bags on that day. We can clearly see from this that blue labels are not before the pre-printed bags. To the right, two later bags of 3/8'' bolts part 111c. The upper ones are brass, dating from the mid 60s, and the lower ones are zinc, dating from 1966 or later. Notes: For the moment, I've removed the 111x.bs versions, as I have yet to see any evidence that the supposed black Korean War versions of these parts exist at all. Please shout if you know different! ¹ Blackened steel bolts are found in three varieties: Mechanised Army parts (with sharp cheeseheads); Army Multikit parts from 1972-77; and the second version of Army Multikit parts 1978-79 with dome heads. 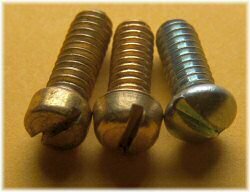 ² Roundhead brass bolts were supplied in 1978-79 Highway Multikits, and in the new outfits 1-5 of 1978-79. ³ Parts 111 and 111a were supplied as zinc plated roundhead bolts for the Space 2501 sets in 1979, from Binns Road. Later, the same variety appeared in the Sprint, Beginners, and Basic sets and subsequently the Enthusiast sets of traditional Meccano outfits up to 1992 or early 1993. Have you N°111 brass long bolt to solde? Hi. Have checked my manuals for part 111d introduction. My edition of the manual #1 for 1239 does not include the part but from the 140 print issues part 111d is shown.